Somewhere amid a lifetime of pounding, 5-foot-9 defenseman Kevin Roeder figured the most lasting impressions are left by taking on the biggest of targets. This is precisely how Roeder found himself in the firing line of Rochester's Trevor Gillies in an AHL preseason game last month. Roeder, playing for the Syracuse Crunch at the time, was controlling the puck when he saw Gillies heading for him. No matter that the 6-foot-3, 235-pound Gillies is one of the most boisterous heavyweights in the league. The 195-pound Roeder got rid of the puck and laid into the freight train. Gillies took exception to the rudeness and chased after Roeder, which is when the Crunch's Kevin Harvey stepped in to address matters. Gillies didn't get a chunk of Roeder that time, but the rookie's name no doubt was entered into his mental data bank. "That's how you have to do it. That's how you are going to earn respect from your coaching staff and teammates," Roeder said. "You have to make yourself known." These days, Roeder's reputation is spreading into Cincinnati, where he's signed to play for the ECHL Cyclones. Chances are he won't be taking anyone by surprise there. Roeder, 23, has been blasting bodies just up the road for the past four seasons. The trail of hurt stretches all the way back to Miami (Ohio), where Roeder, despite his modest size, earned several notches on his stick by packing one of the biggest punches in college hockey. He was a plus-50 during his career there, and in his senior season earned the nod in a captain's poll as the hardest hitter in the CCHA. "It's like a wall running into him. He's the only person I hate going into the corner against," said Crunch forward Tim Miller, who played against Roeder at Michigan. "When you hit him, you feel it," added Syracuse forward Brock McBride, a foe of Roeder at St. Lawrence. "You underestimate how solid he is." Opponents generally make that mistake just once. Ever since Roeder, a native of Glenview, Ill., reached the age in youth hockey where contact was allowed, he made pain his calling card. "I like contact. I don't know why. 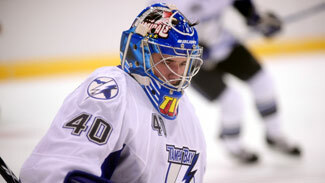 I think it was cool you could hit, and watch NHL players make big hits," Roeder said. "That was something I wanted to do. You have to understand someone is going to hit you, that's part of the game. Once you get scared, who knows what's going to happen?" Fearlessness runs through the family, and to a much more important end. Roeder's father, brother and grandfather are firemen in the Chicago area, and that's a field he'd someday like to explore. "It's a very rewarding job, very thrilling, exciting," he said. "It's something (where) you can wake up every day and be excited to go to work, because you know you can accomplish something, give back to the people." Despite his love for fanning the flames on the ice, Roeder was relatively unknown when he got to Miami. So he changed that the only way he knew how -- by lining up the biggest opponents he could find and introducing himself. "As a freshman you have to make a name for yourself," he said. "It started early. In our first game I had a big hit. I made a presence for myself right away. It was something that was noticeable right away." Roeder understood the potential toll of that philosophy. In his freshman year he found himself as the cold cut in a sandwich created by two Michigan players. He took an elbow to the face, opening up a huge gash that required 40 stitches to close. "I looked in the mirror. I had a huge hole in my forehead," he said. "I'm thinking, 'Wow. That's going to be a lot of stitches.' You just have to have a mindset that those injuries are not going to affect you. I think it's just a mentality you are born with. You are born with a mentality you are going to be a winner." Roeder made sure to tug along the rest of the RedHawks for that ride. Last season Miami reached the NCAA title game before losing to Boston University in overtime on a shot that deflected off Roeder and into the RedHawks' net. Despite the crushing end, Roeder received a consolation prize in the form of a spot on the All-Frozen Four team. Columbus, which had been tracking Roeder in its own backyard, invited him to try out with the Crunch, and he arguably was one of the best defensemen in camp. The size and age of his targets changed drastically; his recklessness did not. "Those men are stronger. But it still doesn't affect my style of hockey," Roeder said. "I don't think the guys I play against think a guy 5-9 is going to pop up and hit (them). I have to earn the respect." The Blue Jackets tipped their cap with the offer of an AHL/ECHL deal. Roeder, though appreciative, was interested in something more along the lines of a one-way AHL pact. So, staying true to the roll-the-dice mentality of someone who enjoys challenging a player like Gillies, Roeder said no thanks to Columbus in favor of opening more eyes in Cincinnati. "I have no problem going out there, showcasing myself at the ECHL level. I will go out there, showcase myself and hopefully something will pop up," he said. "That's life as a professional athlete. You are going to have your ups and downs and you fight for a spot. I'm just excited for my next obstacle."